On Soul of a Nation's opening day, The Broad will present a day of enriching conversations, artist talks and poetry, organized by UC Irvine professors Bridget R. Cooks (associate professor, African American Studies and Art History) and Frank B. Wilderson III (chair of African American Studies). The event will include compelling conversations between artists featured in the exhibition, such as Jae and Wadsworth Jarrell and Gerald Williams with Vida L. Brown (visual arts curator, California African American Museum) and Mel Edwards with Dale Davis (artist and co-founder, Brockman Gallery), facilitated by Isabelle Lutterodt (director, Los Angeles Municipal Art Gallery), as well as renowned art historians and curators like Thelma Golden (director and chief curator, The Studio Museum), Phyllis J. Jackson (associate professor, art history, Pomona College), Kellie Jones (professor, art history and archaeology and the Institute for Research in African American Studies, Columbia University), and Naima J. Keith (deputy director and chief curator, California African American Museum). A reading will be given by distinguished poet Kamau Daáood, author of “The Language of Saxophones: Selected Poems of Kamau Daáood” and the critically acclaimed album, Leimert Park. Darren Walker, president of the Ford Foundation, will speak in conversation with Academy Award-nominated filmmaker Ava DuVernay. 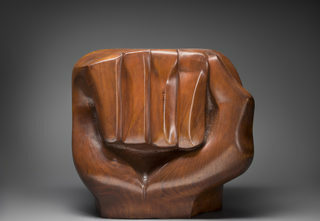 Image: Elizabeth Catlett, Black Unity, 1968 (detail). Cedar. 21 in. x 12 ½ in. x 23 in. Crystal Bridges Museum of American Art, Bentonville, Arkansas, 2014.11. Photography by Edward C. Robinson III. Ⓒ Catlett Mora Family Trust/VAGA at ARS, NY.